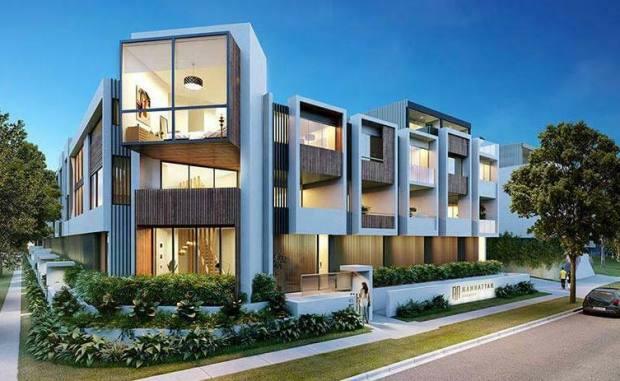 Developer Urban Construct will deliver 80 luxury terrace homes to one of Brisbane’s most sought after inner-city enclaves with the launch of the $75 million Manhattan Terraces in West End. The high-end terrace homes will be individually titled and pitched to discerning owner occupiers. Urban Construct managing director Todd Brown said Manhattan Terraces would deliver a totally unique product to the market. “Our research shows strong demand for high-end, owner-occupier targeted homes in West End and until now there has been no new product catering to this market,” he said. Mr Brown said Urban Construct had deliberately underutilised the site. “The site was zoned for eight storeys but bigger isn’t necessarily better so we listened to the market and in doing so, believe we have created a product befitting this blue-chip site. Place Estate Agents CEO Damian Hackett, who is marketing Manhattan Terraces, said West End had long been favoured as a residential location but its revitalisation spelled opportunity. “West End has been underdeveloped for a long period of time and for that reason there is real upside and potential for capital growth,” he said. Mr Hackett said West End’s retail renaissance played a large part in its appeal. “High end dining and retail providers are making their mark on West End,” he said. Manhattan Terraces will feature luxury terrace homes from $799,000 - $999,000. The empire terrace home with four bedrooms and five bathrooms will be priced at $1.59 million. Homes will be equipped with high quality fixtures, fittings and finishes and will include Miele appliances to give a luxurious finish. The community will feature private courtyards and pocket parks with many terrace homes having access to their own rooftop retreats. Manhattan Terraces features individually designed residences by a team of three local architects, Marc & Co, TVS architects and Jeremy Ferrier Landscape Architect who all have extensive experience in the West End market. Each terrace will utilise its alfresco windows and spacious balconies allowing great natural light to enhance the timeless designs. The terraces will be situated in the Brisbane Sate High School catchment and will be close to a range of amenities and public transport options.